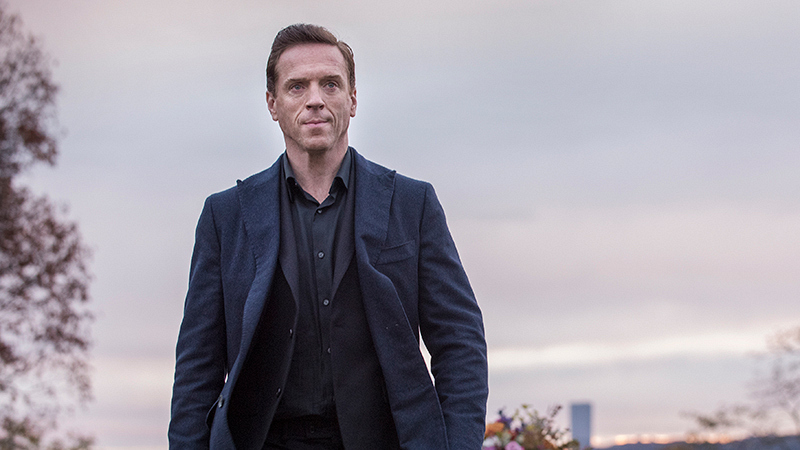 Damian Lewis, Billions Dollar Baby Award-winning actor Damian Lewis makes fans swoon as powerful Wall Street wizard Bobby Axelrod on Showtime's hit series Billions. Some say that acting is an exercise in pretending—though mere pretending, with its intimations of considered fakery, seems too shallow a frame. More accurate are those who insist that acting is, at its best, a form of lying; a masquerade so thorough and convincing that it can seduce the viewer into believing the masquerade and the person behind the mask are one and the same. Malin Akerman as Lara Axelrod, Damian Lewis as Bobby "Axe" Axelrod, Maggie Siff as Wendy Rhoades, and Paul Giamatti as Chuck Rhoades. Bobby's unvarnished swagger behooves a man who delivered newspapers as a boy and now finds his image, for better and worse, emblazoned on their front pages. But he's not your generic self-made man. He's a self-made king: the former parking attendant who's amassed a stable of cars, the erstwhile caddy once forced to settle for a measly 16 bucks a loop who secures naming rights to a building currently inscribed with the name of the golfer who fired him. If you need proof that revenge is a dish best served cold, take a look at the barely concealed smirk on the face of Bobby Axelrod when he stiffs the man's family for a tidy $16 million. The uniformly adoring descriptives of Bobby offered up by his relentlessly self-indulgent wingman Wags (David Costabile) run to macho-drenched phrases like "a jaguar shark" and "as steely as a Roman centurion." For an index of how seriously Bobby takes this bellicose identity, and how seriously he requires others to take it, consider that his chief of staff commits a firing offense by telling him, "You are not a machine. You're human." It's a statement that would offend a less furiously driven man purely because it's so absurdly obvious, but Bobby responds by saying, "I'm not human. I am a machine. I'm a f*cking terminator." Lewis issues those rapid-fire words, spat rather than spoken, with the fatal intent of bullets from an Uzi. Damian Lewis as Bobby "Axe" Axelrod and David Costabile as Mike "Wags" Wagner. All of this bludgeoning behavior is delicious to watch, not least because Lewis has given us a character who clearly delights in it too. Yet what vaults his riveting performance from the pedestrian "good" to exceptional—even great—are those unexpected flashes of vulnerability when the stony machismo melts away like frost confronted with sunlight. "I'm a flawed man," he tells his young sons. "I'm not perfect. I'm not always right. I don't always win." A moment like that can leave you wondering if, at times, Bobby's revved up Master of the Universe persona serves the same purpose that thorns serve on a rose. Excerpted from the "Billions Dollar Baby" feature story in Watch! Magazine. 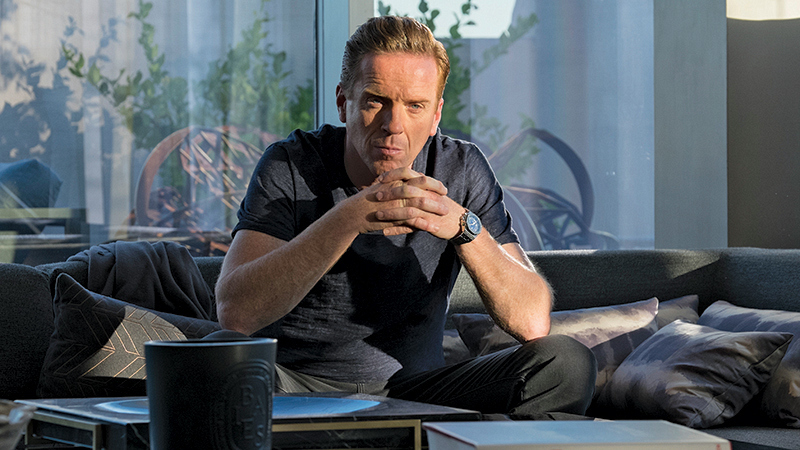 To read more on Billions and Damian Lewis, pick up the May-June 2018 issue of Watch! — on newsstands now! Photo Credits: Jeff Neumann/Showtime (2); James Minchin/Showtime; Jeff Neumann/Showtime; Mark Schafer/Showtime. 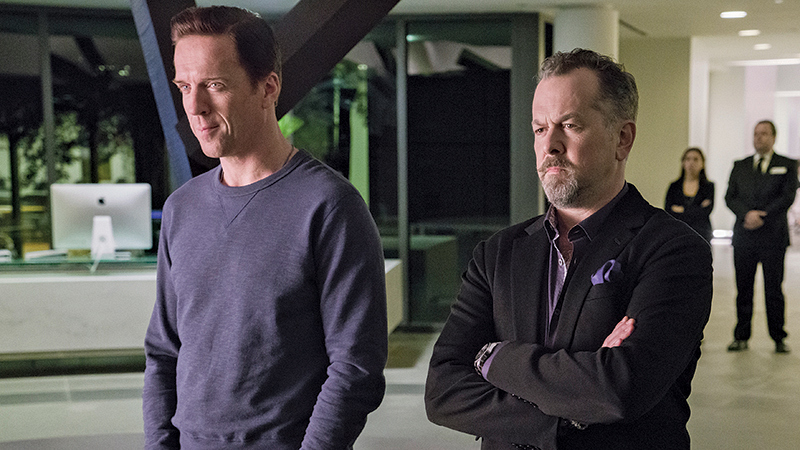 Watch the season finale of Billions on Sunday at 10/9c on Showtime and stream full episodes on Showtime Anytime.